This place is absolutely amazing and we enjoyed a fantastic family holiday here. The property itself is stunning and a real credit to the owners, who went out of their way to help us whenever we needed them. The location is perfect for nearby Honfleur, a town which has everything you will need to help you enjoy your holiday. I would highly recommend staying here, you will not regret it. We arrived the first day of the summer holidays and was delighted to be so close to Honfelur. There was 6 people in our party, I wouldn't recommend the accommodation for this amount of people as my two children had to 'top and tail' and me and my husband were in single beds. The garden is amazing, perfectly kept, the kids had lots of fun making friends with other children on site and playing hide and seek. The Inside the property could do with a bit of a make over as lots of light bulbs had gone, We couldn't get the TV to work, wifi only worked if you stood outside the owners house. Location wise, perfect. A two minute drive down the road and you'll find a lovely bakery, pub and restaurant, also a small shop. Beaches are lovely and there are some great restaurants by the harbour. If you don't speak good French, it may be worth investing in a French book/translator book as most menus are in French only. We stayed for two weeks in this cottage and will have a lifetime of great memories. The accomodations are perfect - the home is very clean and includes everything you could need for your holiday. The size is bigger than expected. All the furnishings were comfortable. The wifi worked fine. THe location is what makes this home prefect. 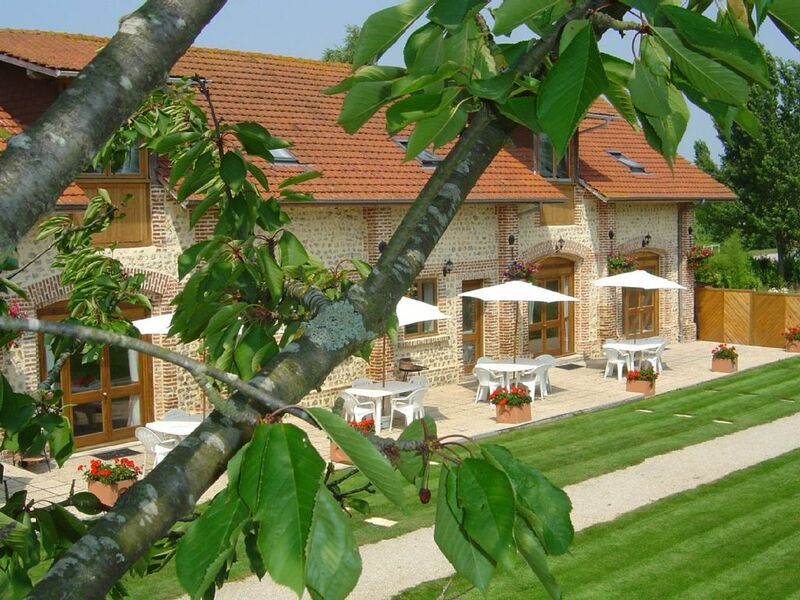 It is centered in Normandy in a location where you canreach everything for a day trip. It is included right in the middle of 3 of the Lonely Planet best drive in Frances - the cheese tour, the Monet tour and the D-day tour. We visited sites in all and always make it back early enough to relax in the lovely grounds. We recommend this home to all - the Websters will show you a great time. We would highly recommend this accommodation. It is ideal for exploring this area of Normandy and the Gite provides more than adequate facilities.Mr and Mrs Webster(the owners) are very friendly and helpful and have done a wonderful job in renovating Cherry Tree Cottage and its surrounding gardens.We found that all decriptions of the property were accurate.